A unique objet d’art, METEORIS unites the most legendary meteorites and depicts the solar system in truly spectacular fashion. 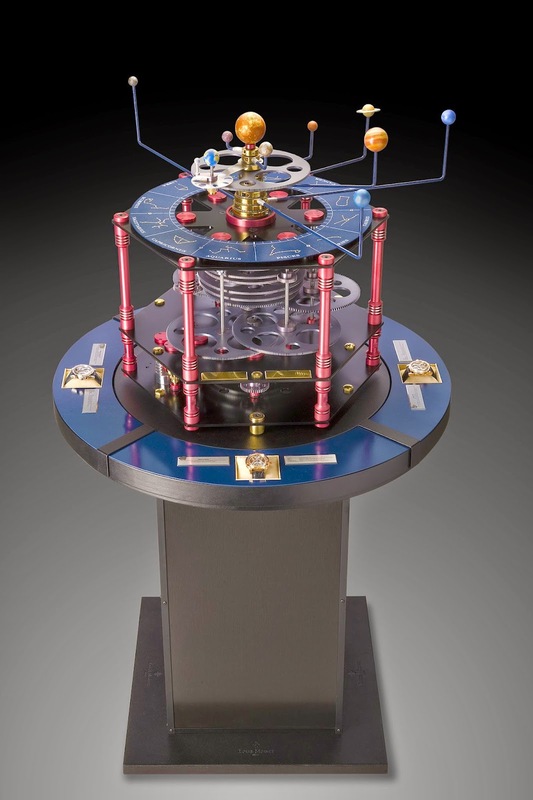 METEORIS is composed of four tourbillons and a new form of planetarium. 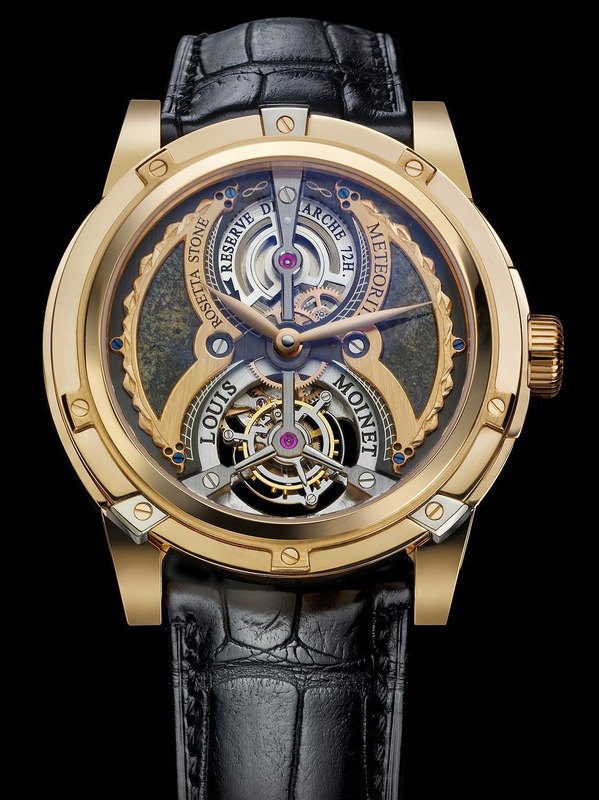 METEORIS intensifies the magic of the tourbillon by connecting its carriage to the barrel by means of a hand-drawn and bevelled vertical bar. To add to the fascinating vision of the tourbillon carriage in motion, METEORIS offers an openworked version of the barrel. 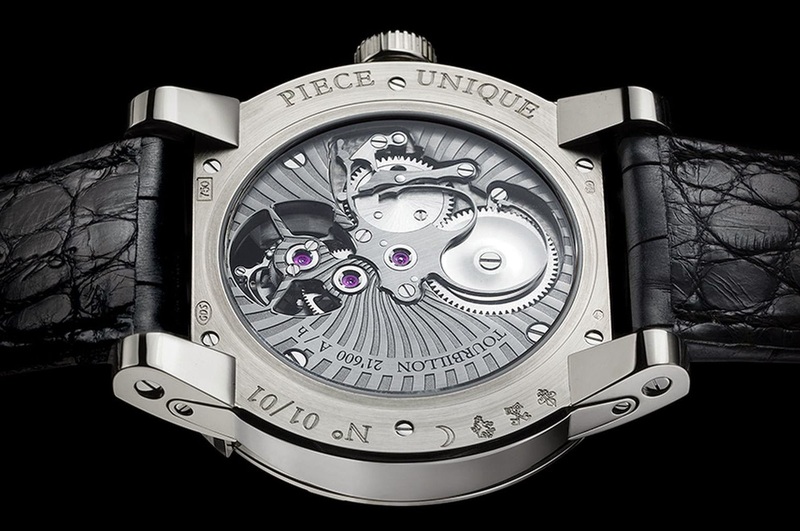 The latter’s cover performs an average rotation in six hours and enables one to keep visual check on the power reserve according to the state of wind of the barrel spring. Louis Moinet displays its determination to combine aesthetic and technical aspects, particularly through the vertical bar that showcases the technology of the watch, while extending over onto the case. This original and modern way of uniting displays, technology and casing is directly inspired by the historical world of Louis Moinet, and especially by some of the drawings published in his famous Traité d’Horlogerie in 1848. 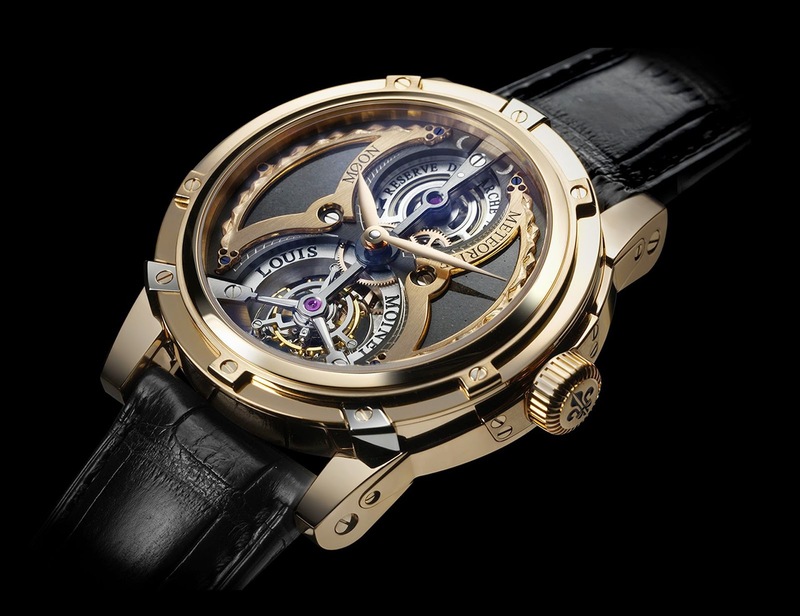 The exclusive METEORIS tourbillon movement is hand-wound and beats at a cadence of 21,600 vibrations per hour. One particularly striking technical characteristic is the spectacular visibility of the winding mechanism through the case-back. The “octopus” spring plays three roles by acting as pull-out piece spring, lever spring and click spring. METEORIS is presented in an exceptional case composed of 50 different parts. 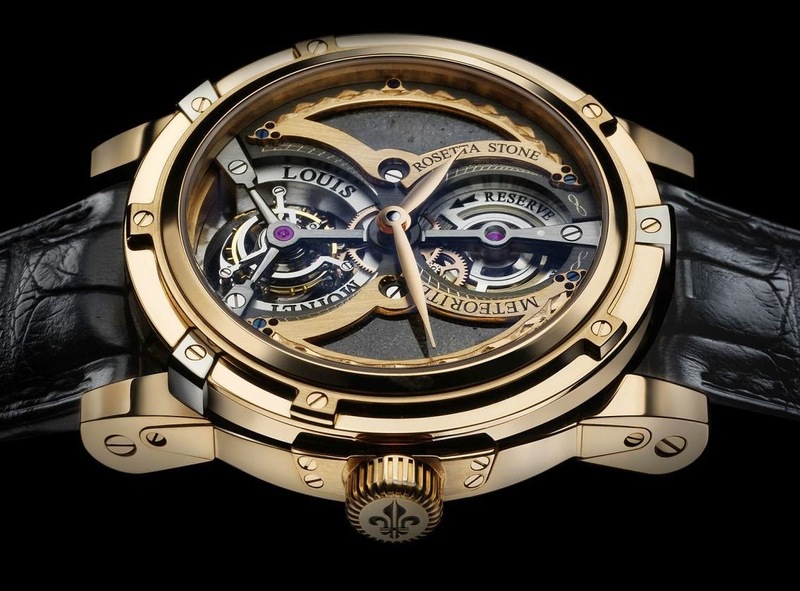 The case is also equipped with the Louis Moinet crown guard, incorporating the stem in such a way as to enable easy replacement if required (patent pending). This tourbillon presents a meteorite from the planet Mars, finely inlaid into a hand-engraved dial and adorned with an astrolabe-type appliqué, serving as a reminder of the ties between man and the cosmos. 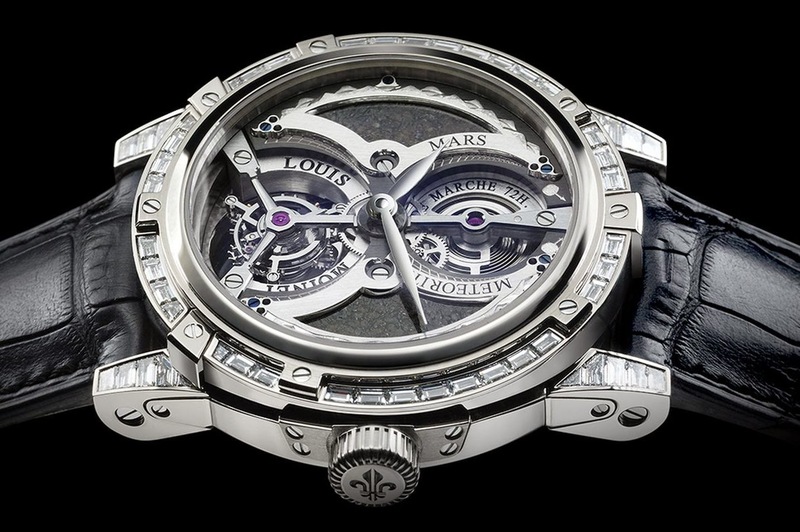 This is a world first, since no stone from Mars had ever yet been used in watchmaking.The case of this unique model is crafted from 18-carat white gold set with 56 baguette-cut Top Wesselton VVS diamonds totalling 3.46 carats. Mars Meteorite. Martian meteorites are Martian rocks that were ejected from Mars by impacts and later fell to the Earth as meteorites. The meteorite used in this model has been nicknamed the “Rosetta Stone” because it is the oldest known rock in the solar system and the oldest meteorite ever found on earth – with an estimated age of 4,566,200,000 years. 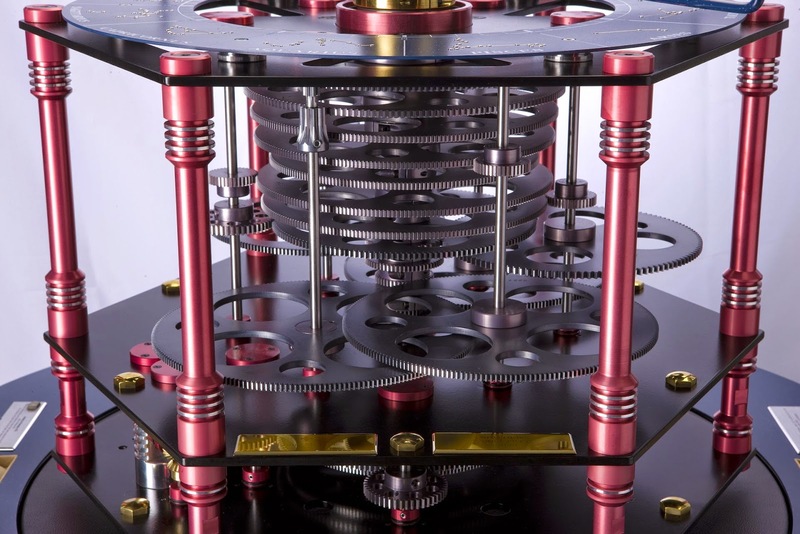 The extremely complicated case of this unique model is crafted in 18-carat rose gold and comprises 50 different parts. Legendary meteorite, considered as the “Rosetta Stone” of our solar system. The oldest known rock of our solar system and the oldest meteorite found on earth. Authentication: Institute für Planetology, Münster, Germany. The meteorite adorning the hand-engraved dial comes from Itqiy, a mysterious asteroid that was formed near the sun. 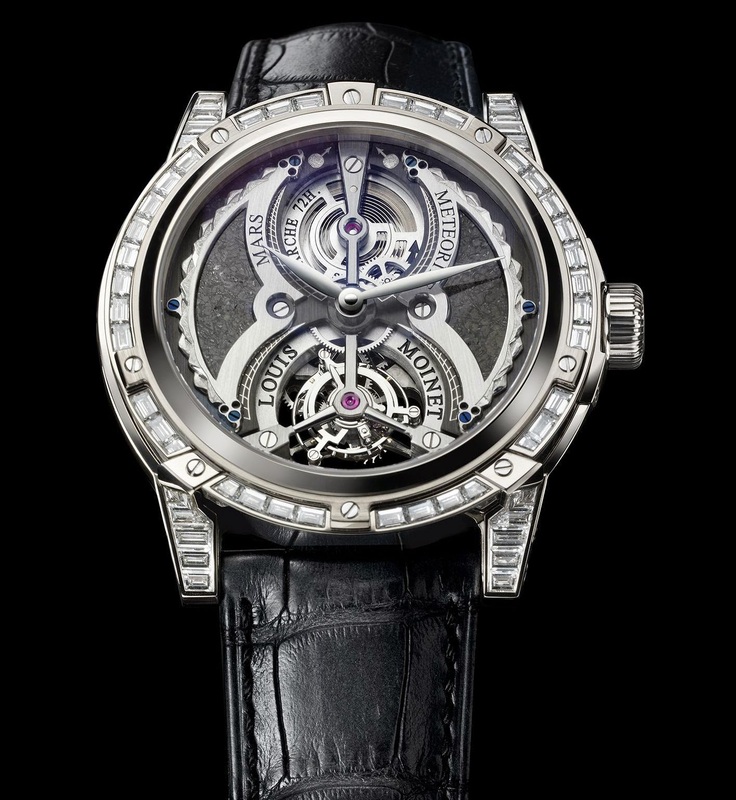 Itqiy has provided invaluable scientific information on the formation of the solar system, while its own origin remains a mystery.The “Asteroid” tourbillon is presented in an 18-carat white gold case set with baguette-cut diamonds and engraved with the legend “Pièce Unique”. 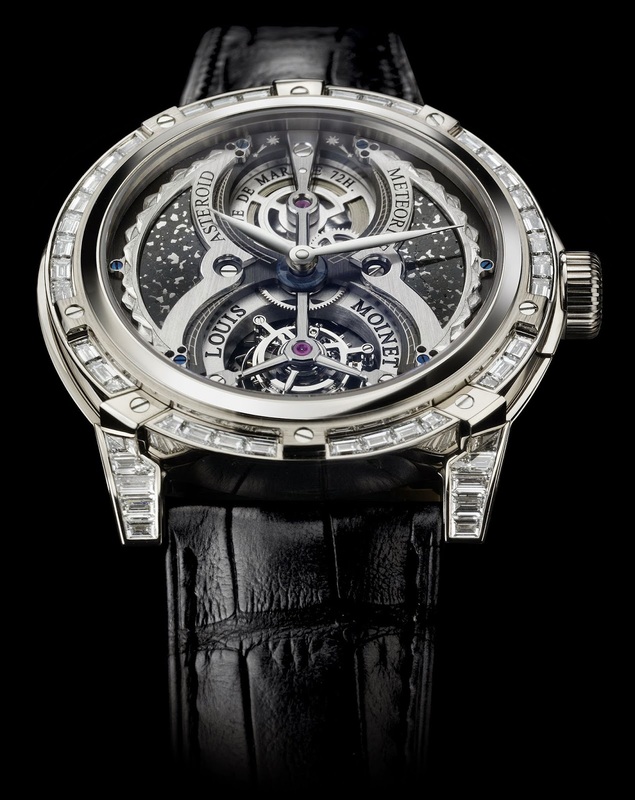 As with the other tourbillons, a hand engraving on the dial depicts the meteorite’s trajectory towards the earth, represented beneath the hands by a pietersite gemstone. Unique and mysterious asteroid formed near the Sun. It has provided invaluable scientific information on parts of the solar system rarely sampled. The first tourbillon to picture an authentic lunar meteorite,“Moon” is distinguished by its dark structure featuring a number of fine occlusions. This tourbillon watch is crafted in 18-carat rose gold and fitted with a hand-sewn crocodile leather strap lined with genuine alligator leather. Moon Meteorite. Lunar meteorites are moon rocks that were ejected from the Moon by impacts and later fell to the Earth as meteorites. Authentication: UCLA, University of California, Los Angeles. Buckle : 18K gold folding clasp with Louis Moinet symbol. METEORIS is a new form of planetarium depicting the entire solar system. Mercury, Venus, the Earth, the Moon, Mars, Jupiter, Saturn, Uranus, Neptune and Pluto are all shown gravitating around the Sun.This represents a major technical feat, since the vast majority of planetariums show a limited number of planets, whereas METEORIS shows the whole solar system. METEORIS is particularly spectacular thanks to its faster rotation speed that provides a better understanding of the solar system. This acceleration of the planets enables the Earth to rotate around the Sun in 37 seconds instead of the usual 365 days. The planetarium is the work of Rémy Chauvin, a mechanic who specialises in gears. 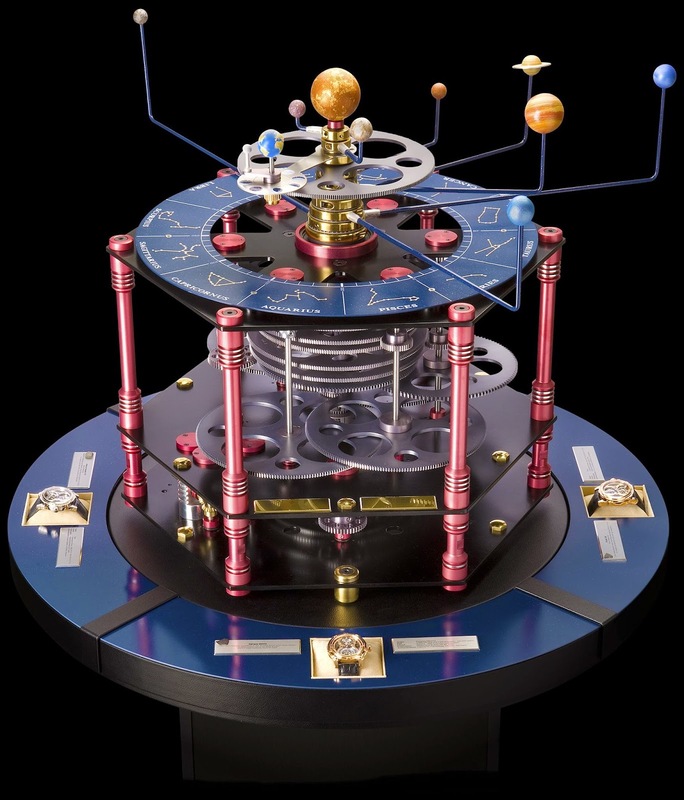 Rémy Chauvin designed and manufactured the extraordinary astronomical clock in the Watch Museum in Morteau (in the Doubs region of France), which comprises 1,680 parts and took 14 years to complete. 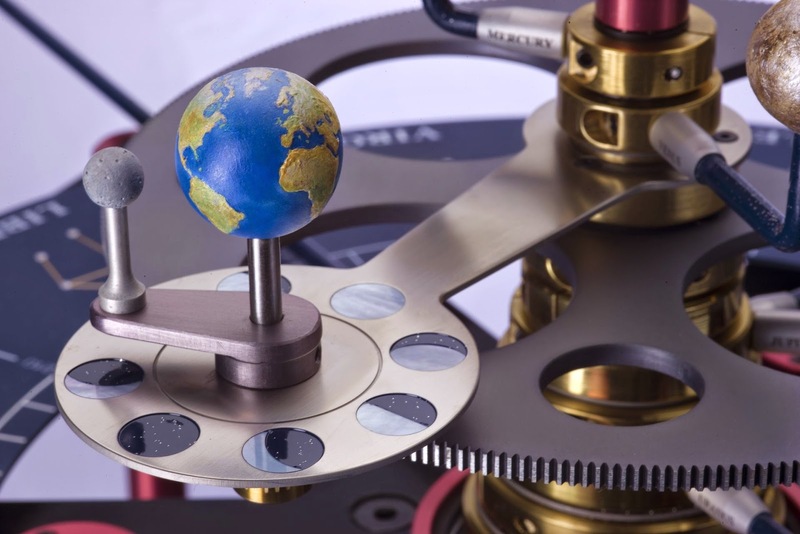 The mechanism of the METEORIS consists of ten coaxial tubes prolonged by stainless steel spokes supporting the planets and driven by a complex set of gear wheels. The entire set of 40 gears made of Zicral work in a perfectly coordinated manner so as to drive the solar system. This system of gear wheels is driven by a reducer micro-motor. 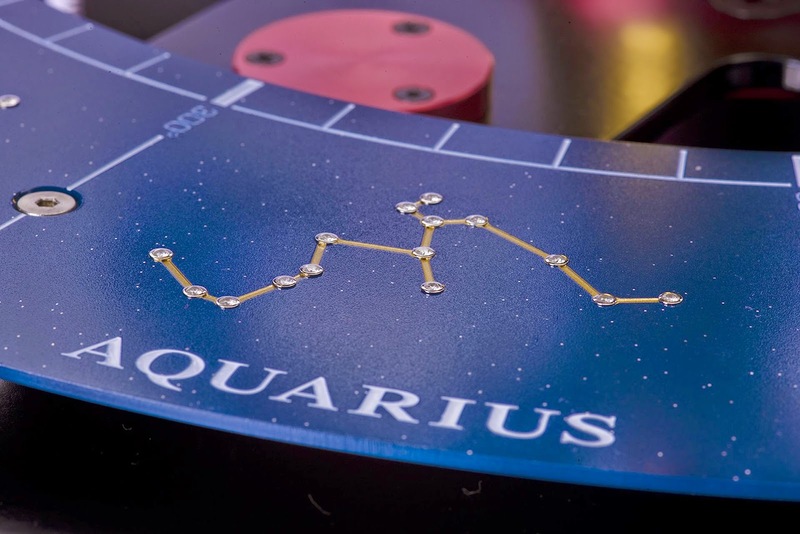 This new type of planetarium features modern and noble materials including Fortal, Zicral and stainless steel. The finely fashioned dial indicates the position of each planet within the zodiac sign through which it is crossing. The midnight-blue lacquered dial is sprinkled with silver spangles. Each of the twelve constellations is adorned with gold dust and the 154 stars are represented by rhodiumed set with Top Wesselton VVS diamonds totalling 5.60 carats. 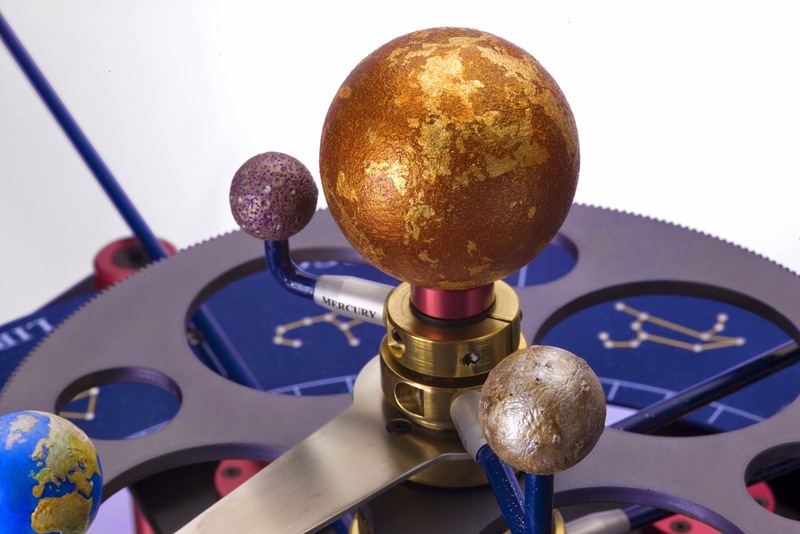 The Sun and its 10 planets were crafted by the artist Jean-Yves Kervévan, using hand-made resins and varnishes. Mars and the Moon are coated with dust from Martian and Lunar meteorites. The Sahara 99555 meteorite has yielded a powder that is applied to Mercury, from which it may well have originated; while the Sun is dusted with particles from the Itqiy meteorite. The Earth is coated with powder coming from rare rocks found in the Sultanate of Oman. The Earth and the Moon are mounted on a subdial that provides direct read-off of the Moon Phases, portrayed in mother-of-pearl and blue-tinted lacquer specked with silver spangles.